The BBC has announced that their controversial iPlayer on-demand video application has been downloaded over a million times, and that users have viewed over 3.5 million programs. BBC research reveals that an average of a quarter of a million programs have been downloaded or streamed each day since 25 December. Users, on average, watch each streamed program for just under 25 minutes, while the number of users choosing to stream content currently outnumbers downloading by a factor of eight to one. Whilst the top ten most popular programs account for just under a quarter of all those consumed via the BBC iPlayer, programs that are ranked outside the top 50 actually make up almost half of the total consumption. Christmas Day edition of EastEnders (BBC One). The BBC research also suggests a significant “long tail” effect, with the BBC Four series Dance Britannia, a history of the evolution of dance, the documentary Factory: Manchester From Joy Division To Happy Mondays (BBC Four) and BBC Three’s The Real Hustle all appearing in the top 100 most streamed programmes. “Attracting a million visitors, who’ve accessed over three and a half million programmes, within just two weeks is a wonderful start,” said Ashley Highfield, Director of BBC Future Media and Technology. “People who use the BBC iPlayer are spending nearly half an hour a day watching streams of their favourite programmes, suggesting that it looks set to revolutionise the way BBC Television programmes are viewed in the UK. BBC’s iPlayer offers users the opportunity to either stream or download BBC programming on demand. Streaming allows users to view programmes from the previous seven days instantly, while those who download can keep the programmes for up to 30 days. Figures for average duration of each stream are calculated from the beginning of the stream to the end of the stream, and do not include time otherwise spent on the BBC iPlayer site. 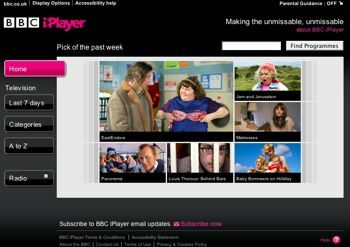 The iPlayer has been the subject of a certain amount of controversy because of its proprietary nature, use of DRM and limitation to Windows computers.